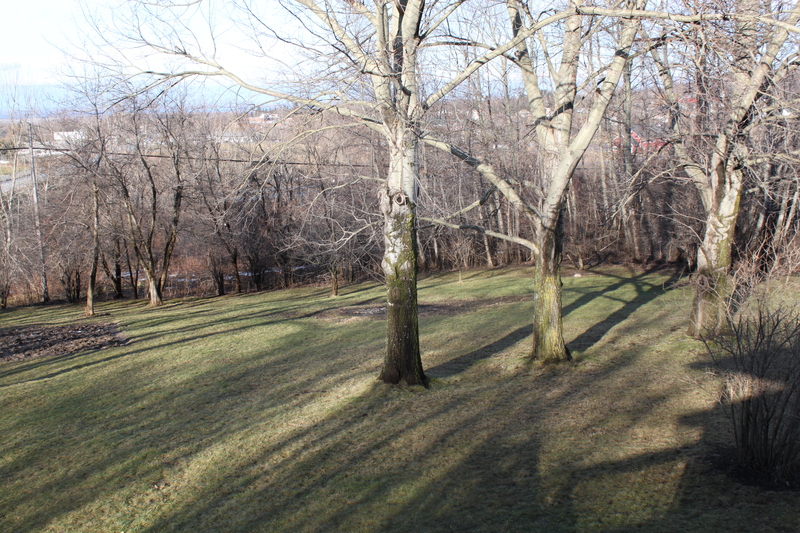 This morning I woke up and found pretty much no snow on my St Albans, Vermont lawn. It had been covered with about eight or nine inches of snow just three mornings earlier. Blame a New Year’s weekend thaw, which brought temperatures as high as 50 degrees. It’s been above freezing since early Friday morning. My backyard Sunday morning. Just 72 hours, nine inches of snow covered the yard, but a big thaw got rid of that. I have seriously mixed emotions about this. On the one hand, I’d been watching the snow cover gradually build up toward a point where I could go snowshoeing. On the other hand, the sudden lack of snow gave me an unexpected chance to do more to get my landscaping and yard in shape. As the snow melted Friday, I focused on cutting small trees and brush I disliked. Saturday, with much of the snow gone, I could start cleaning up the mess left when I burned my brush pile in mid-December. The snow had been on the ground came in December, before the ground froze. So today, with the snow gone, I could dig in soft earth. Usually in January, the soil is frozen into the consistency of concrete by now. Not this year. Today, I was out there about six hours. I turned the big compost heaps, dug out holes where I will transplant trees, expanded my vegetable garden, and used the sod I took up from the garden expansion project to shore up an embankment by the brook in front of the house. The warm weather really was a winter gift. I knew I had to get stuff done this weekend, because weather seems to go in opposites from season to season. Last year, on New Year’s weekend, we had a foot and a half of new snow. But last year, the snow melted early, and by mid-March I was in the clear to attack the yard. That probably means this year, the snow will stay on the ground until April. So I went crazy in the yard this weekend to avoid losing an opportunity to stay ahead. Tomorrow is supposed to be colder, but no snow yet. I also have tomorrow off from work, so I can do more things around the house; I just can’t do stuff that needs unfrozen ground. So I can cut more branches that are wrong, take the rocks I found over the weekend that would contribute to more stone walls I will build and store them in back of the shed for now. And I can do other tasks. By midweek, forecasters say, we’ll have a couple inches of snow on the ground to make it look like winter again. Meteorologists also say there is a chance, just a chance, we’ll get a large snowstorm by Friday night or Saturday. If that happens, I can forget about the yard for now and turn my attention back to the snowshoes. This entry was posted on January 3, 2011 at 1:44 am and is filed under Uncategorized. You can follow any responses to this entry through the RSS 2.0 feed. You can leave a response, or trackback from your own site.